We are recognized in the industry for manufacturing and supplying an extensive range of Dhal Powder. The offered powder is used to provide rich taste to the plain cooked rice which is eaten with varied curries as a side dish. Our offered powder is highly appreciated among clients for their rich aroma, unique taste, purity and longer shelf life. Denim can be blended with a variety of other materials .Tencel / Excel / Linen / Spun Poly are some of the best blended denims fabrics. This is a mild yet aromatic spice blend that goes well with vegetarian dishes. Simple yet versatile, its one handy spice mix in the kitchen. We are a leading Supplier and Exporter of high quality Dhal Powder in India. We offer Dhal Powder to our customers at the market leading prices. Our Dhal Powder is processed under extremely hygienic conditions. Our Dhal Powder is extensively used in a number of dishes. 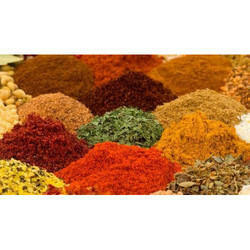 Keeping in mind the diverse requirement of our clients we are involved in offering a wide gamut of Spice Blend. Customers mostly prefer to purchase quality products, so we are involved in offering best quality of Dhal Powder. The offered Dhal Powder is processed using optimum quality of ingredients and highly appreciated amongst our customers due to its premium quality. Our products are available in market in wide range. Pizza seasoning is used to make flavour khakhras and other fast food stuff like pizza pasta etc. Seasonings are blends of various products of essential oils and oleoresins in suitable proportions for specific uses. They have taste, flavor, color and nutritional properties. They have the advantages of consistency in quality standards, long shelf-life, easy-cooking, handling convenience, etc. Adds customized aroma and a distinct flavor to a variety of food preparations.